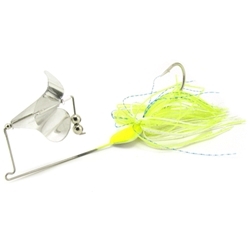 The new ball buster buzzbait makes more racket than any other bait out there. The blade turns and strikes the balls on the shaft making a loud clanking,-squeaking sound. The flat head design rises quickly and allows a slower retrieve. Tune the blade: you can adjust the amount of "strike" on the balls by bending the wire slightly.